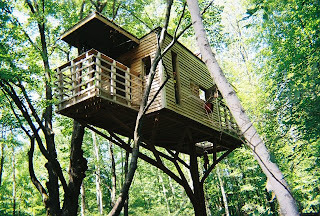 Top Photo: My oldest son gets pulled up to the tree house via a pulley system. He refused to try their new ladder, because he wanted 'to fly.' He might of had trouble with the ladder, because it is harder to climb than it looks as I discovered. One needs to have strong arm muscles to help pull themselves up. Bottom Photo: My son was being pulled up to this tree house. It also has a lift with a special chair for campers who use wheelchairs. It's a one of a kind model made possible, in part, by students from the University of Michigan. Note: These photos were taken while we attended their open house in late July, 2007. Activities such as pontoon boat rides, tours via a tractor-pulled wagon, and horse riding demos were also available. 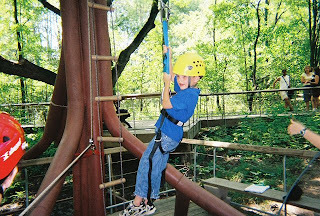 Although it is quite a drive to the Fowler Center from where we live, we went because our son's week long camp session (his third year) for individuals age six to twenty started the next day. Also, the annual open house was extra special that day because this camp for children and adults with special needs was celebrating fifty years of operation. Anyway, I put these photos up as a reminder to myself. I usually have pre-registered by the end of October, but for various reasons I put registration off this year. I'll have to get my act together. My nine year old with autism really likes this place--and they like him. Great photos! Looks like great fun! Thanks. My husband had the camera that day and did a great job. My son seems to have fun at camp.